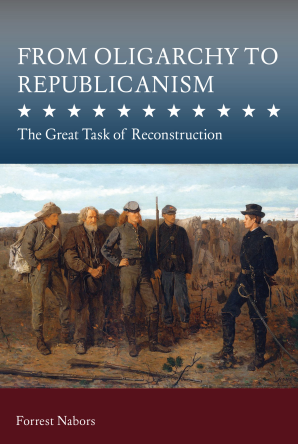 James Read reviewed JMC faculty partner Forrest Nabors’ book, From Oligarchy to Republicanism: The Great Task of Reconstruction in the Library of Law and Liberty. The oft-narrated American story of slavery, emancipation, Reconstruction, and segregation contains some important puzzles that are not easily resolved. Why were white Northerners, many of whom were indifferent or downright hostile to the rights of blacks, willing to fight a long, lethal war against slavery? Why, in the aftermath of that war, did white Northerners support constitutional amendments extending legal equality and voting rights to former slaves—but then allow Southern states to nullify most of those rights for nearly a century? One way of answering these questions is to highlight race as the central factor. White Northerners (such a narrative would go), though racially prejudiced, cared most of all about preserving the Union, and in that effort were for a time able to rise above prejudice in the service of a greater cause. But after the Union was saved, their commitment to racial equality gradually faded. Their accustomed prejudice and indifference reasserted themselves, leaving the Southern states free to violate the rights of blacks. Forrest A. Nabors tells the long story of slavery and its aftermath in a different way. For Nabors, and for the 19th century lawmakers whose arguments he features in From Oligarchy to Republicanism: The Great Task of Reconstruction , the central story is a protracted, high-stakes contest between two radically opposed regime types: oligarchy (“the Slave Power”) versus republicanism, the regime established by the Founders, which presupposed natural and legal equality. James Read has been a Professor of Political Science with the College of Saint Benedict/Saint John’s University since 1988. He received his A.B. from the University of Chicago in 1980 and his M.A. from and Ph.D. from Harvard University. He was the Joseph P. Farry Professor of Public Policy at CSB/SJU, and has been Visiting Professor of Political Science at University of California-Davis. Dr. Read is the author of Majority Rule versus Consensus: The Political Thought of John C. Calhoun (University Press of Kansas, 2009), Power versus Liberty: Madison, Hamilton, Wilson, and Jefferson (University of Virginia Press, 2000) and Doorstep Democracy: Face to Face Politics in the Heartland (University of Minnesota Press, 2008). Forrest Nabors joined the Department of Political Science at the University of Alaska at Anchorage in 2011. He has taught American government and political philosophy at Oregon State University and the University of Oregon. His current scholarly research is focused on the changing character of American government leading up to the Civil War and Reconstruction. Prior to becoming a professor, Dr. Nabors was a high technology business executive in Portland, Oregon. He has remained actively engaged in supporting economic and civic development in his communities. Dr. Nabors is from Fair Haven, New Jersey.